We have some time on our hands before we drop Stace and Steve off at the airport, which means we have time to make Stacey’s wish come true with a visit to Adriano Zumbo’s Patisserie in Balmain. 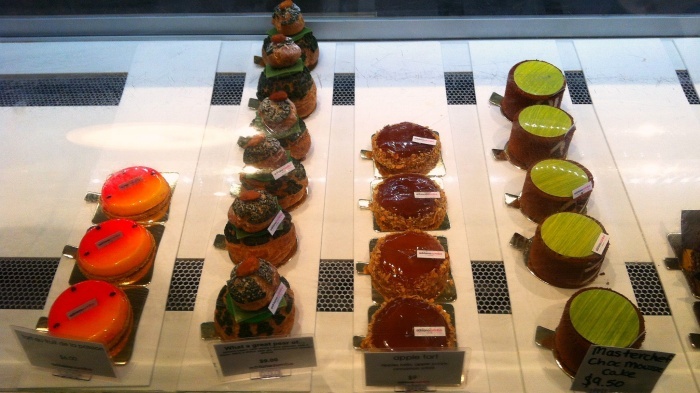 To coin a few cliches, when it comes to this patisserie, size isn’t everything and good things come in small packages. Very good things, in fact! The shop is so tiny and so twee, if you blinked you might miss it. However, inside this teeny treasure trove, is every cake lover’s dream with the most beautiful and delicious looking creations. It truly is a sight to behold. It’s about 3pm by the time we touch down on Planet Zumbo and most of the cakes cases are empty. Here’s a sneak preview of some of the “leftovers.” I don’t know the name of these creations, but when cakes look this good, they can afford to remain nameless! Don’t you agree? 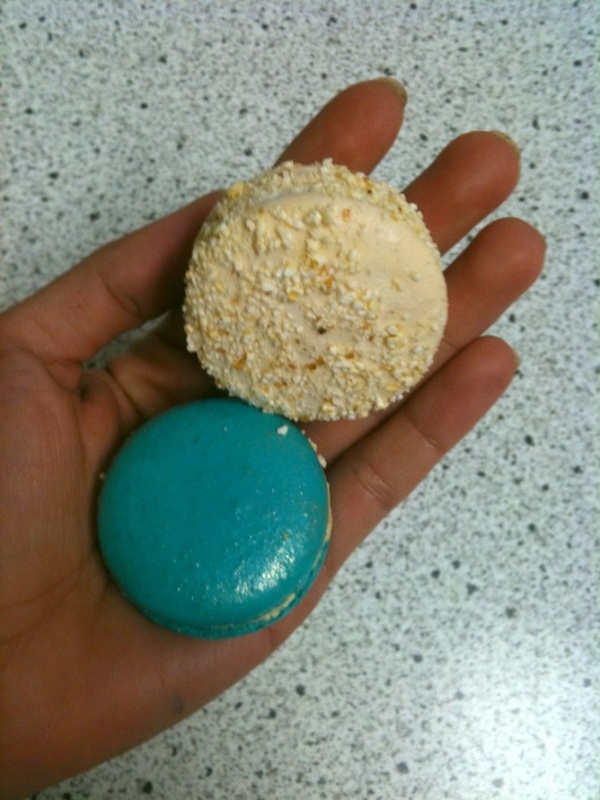 However, as perfect as the patisserie items are, I can give them a miss, because today I am on a macaron mission. I have wanted to try one of Adriano’s zany zumbarons, since I first saw him making and baking beautiful works of art on the very first series of Masterchef Australia. I’m so grateful that Stace has bought us here, and a little bit worried too, because I think I could easily become addicted to zumbarons! 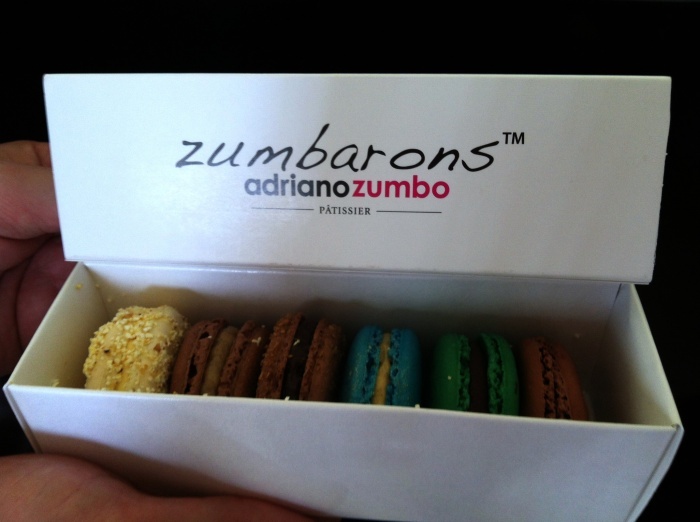 Adriano has a set selection of zumbarons at any given time, and it’s hard to narrow our selection down to only six. It’s a hard job, but someone has to do it. I settle on Malted Milkshake, Lamington, Chocolate Doughnut, Choc Pop, Choc Mint and Salted Butter Popcorn. I can’t wait to get home and dive in. 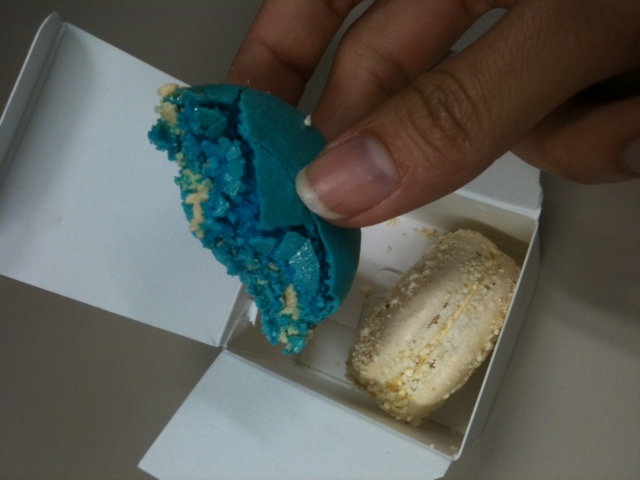 As I’m in situ, I can’t resist getting a pretty pair of macarons for Kitty, sh,e who is in the grip of a macaron addiction. The Malted Milkshake and the Salted Butter Popcorn will see her right, I’m sure. We pop into the park to devour some of Stacey’s spoils, and attack a cake that although nameless, is throughly rich, smooth and chocolatey. It’s so delicious, it’s like I’m having an out of body experience. I think I am high on cake. It feels good until I remember how long I will have to run to kill off all the calories I have just consumed. Ho hum. Eat now, pay later! After the airport run, and some fond farewells, we waste no time in diving in to the zumbaron six back at the ranch. I taste first, devouring my share in a zumbaron frenzy, thoughtfully leaving David the other half. When all the zumbarons taste so good, it’s hard to choose a favourite, although if you held a gun to our heads, we’d have to say the Malted Milkshake is the pick of the bunch. After the high stake indulgence and a great weekend, all we’re left with is a sugar rush, some crumbs and a stack of sweet memories!